Inspired by ocean waves and sandy beaches, this Visions Wave 10" white plastic plate is sure to add an elegant touch to wedding receptions, banquets, and other catered events! Not only does its wide rim have cascading, seashell-like lines to draw guests' eyes toward each perfectly-plated dish, it also helps contain oils, dressings, and sauces to prevent accidental messes and spills. This plate boasts a classic, round shape that lends a traditional look to table settings and is great for serving your signature entrees. Plus, its crisp, white color creates the perfect backdrop for colorful foods, ensuring a striking appearance. Arrived as expected and described. Nice quality even better price.. Bought these for an occasion but may just buy these for everyday plates. Completely washable. Used these for a wedding. The clients loved them! they look and feel like real plates and strong enough to load up with food and not worry about them snapping in half. I will be using these 10 inch plates for food at my wedding. Im very happy with this purchase. The plates came packaged well they were all perfect without a scratch. For the price and how many you get it cannot be beat. I bought these for an outdoor summer wedding. The quality & price cannot be beat. They held up well to all sorts of food, they're not flimsy. I would buy again. These are perfect buffet plates. Sometimes the 9" in this series comes off too small but these 10" have the extra inch that makes the plates seem a lot bigger. Its also helpful that it has a slated scalloped edge it keeps food on the plate and portions within reason. Beautiful addition to a special event! Sturdy, classy and impressive touch. I absolutely can't wait to purchase more of my family dinners this Holiday season! For it being plastic, these plates are beautiful. I love the edge design. You wouldn't know the difference if they were real or not. Elegant plates for a real good price. These are beautiful! We used them for an outdoor wedding with 300 guests and did not want to rent china. They look like china and are very heavy duty. I have used these for a wedding reception and was very happy with them. They look like real fine china and you would never know the difference until you touch them. These give any event a classy look, without paying an armload. I would purchase these again. The Visions Wave 10" Plastic White Plate has a realistic look to them but they are disposable. They are very strong plates unlike other disposable that are flimsy or break easily. These plates will make a great addition to our wedding and they look very classy. Ordered these plates to use at a large dinner party. Theses are priced a lot cheaper than other sites. They came securely packaged so none were broken. They are medium weight and will hold a good amount of food. They do not look like they will bend with the weight of food. They are disposable but look like they can be washed and reused. I will definitely wash the ones that aren't thrown away and towel dry them to use at another time. Excellent quality for the price! I recently used these plates for a family dinner instead of using glass dishes. I love how nice they look on the table. They really give the appearance of an elegant table setting. they also are A LOT sturdier than I thought they would be, and definitely a better quality than the hard plastic plates you may buy in a bulk store. I ordered these plastic plates for a baby shower, they were a hit. The plastic is very strong and they don’t look disposable at all. My sister used these plates in Ivory when she got married last summer, so when I got engaged and got to the process of ordering my place settings, I knew I needed to do so through Webstaurant. These plates are sturdy and actually quite pretty considering they are plastic. These plates will be a perfect addition to our tables at the wedding. The other nice thing about these plates are that you can easily wash them afterward and re-use them, making them very affordable in the long run! I would seriously consider and recommend these to anyone for whatever occasion you are decorating for! Smaller actual plate size excluding the rim than I expected but the strength and durability is great! The ridges definitely add some character. Good quality. Thanks! These plates are perfect! They are sturdy and nice. They help add an elegant and classy feel to any party without having to pay extra for real plates. (Plus the eliminate the hassle of real plates.) The price is extremely affordable! You cannot find that price anywhere in stores for a similar product. I have never seen hard white plastic plates for cheaper than $1, so these are quite the deal. I highly recommend. I have been using these plates since my sisters wedding in 2014. They are always my go to! Our event was held on a beach and these plates were perfect. They looked like sea shells which went very well the theme. They were large enough to hold good sized portions of food which was a good thing cause they needed to be sturdy. My guests really know how to pile it on. All in all, I was very happy with this item and its price. We LOVE these plates so much. They look really fancy without having to break the bank. Perfect for a wedding occasion where you don't want to spend an arm and a leg on dinnerware. omg these plates,were plain and simple.But nice enough to decorate my tables for a royal look. These white plates I used at my wedding also.These will be a classic. Couldn't be happier with this product. They are very sturdy. Well packaged. Not one broken. Sturdy enough to serve and cut meat on and that says a lot. My new go to plates for nicer events. I love these plates! They are excellent quality, and are extremely durable! I love the design around the plate. They are great for formal dining as well as everyday usage. beautiful, white , and shine big plate. they are enough big to hold chicken, rice, and salad. they look so realistic that every one though they were china plates. A very nice all purpose plate that is great for any occasion. The white plate is a great neutral color. The plate is very sturdy and well made. Great for anything. 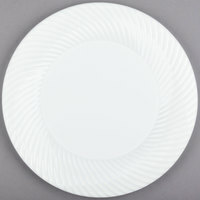 For a plastic white plate this item is strong and durable, but also very pretty with the decorative edging. It’s perfect for a casual event....or even an upscale wedding. I originally ordered Visions Wave 9" white plastic plates but felt they were too small. I ordered the 10" plates and I was extremely satisfied as they fit more food comfortably. Just be aware that the border is large so if you need more surface area another product without a border may be your better option. Don't really like using plastic but necessary around the pool. The plates are nice and serve the purpose. Nice to have a supply at hand. This are not just beautiful, they are elegant and heavy duty as well! Got them for a church gathering and everyone loved the way it looked and how sturdy it was! Thanks webstaurant store! These have become my formal disposable go to plates for all events. They are the right weight and strong. They hold a lot of food well. These plates are a great size and have a wonderful design. I was hoping they would be thicker. They would be perfect for a lighter meal! We needed plates for our wedding. These were perfect and much nicer than anything we could get in the stores. Will use again for our daughters wedding. These plates are simple but elegant and is a change from using paper goods. Every one loves them and will continue to use on special occasions. Bought these for our wedding reception dinner. They are very pretty and great quality. Also, much cheaper with such a big quantity than what I could get at a big box store. Glad I found these! We ordered the 6" plates for cake as well. Ordered these for a client to use at a sweet 16. They were great. The guests actually thought they were real china. A great product for any occasion. Ordered for wedding to have nicer place settings. Lightweight and fairly sturdy. Pretty design on outer edge of plate. Waiting for smaller plates to be availabe to order along with these. Love these so much! I Purchased them for my November wedding and the will be perfect! I Would highly recommend! They are very sturdy. Love!